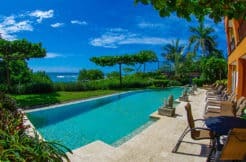 Located just a few steps to the white sand beach and shimmering tide pools of gorgeous Playa Langosta sits one of the finest examples of Oceanfront Luxury that Costa Rica has to offer, Casa Roca. This 5 bedroom home is truly “luxury at it’s finest” with an eclectic, tropical design and indoor/outdoor living that will leave the most seasoned traveler in awe. The home is located in the most sought after stretch of beach in the country, Playa Langosta, and is a short 2 minute drive to the heart of the thriving beach-town of Playa Tamarindo. Designed by renowned Costa Rican Architect Abraham Valenzuela this home leaves no detail overlooked! Marble floors, ceiling murals, unbelievable finishes and more make this Villa amazingly unique. Featuring over 7000 sf of living space, 5 master suites, 7 bathrooms, huge indoor/outdoor common areas, a gourmet kitchen, oceanfront swimming pool and Jacuzzi, full time staff and more. Each bedroom features a king sized bed plus en-suite bathroom, gourmet mattresses, linens, bathrobes and more. The staff at Casa Roca cleans the home top to bottom each day and is available to prepare delicious gourmet meals for guests for a reasonable, additional fee. If you’re looking for luxury, seclusion, privacy and security, look no further.